Each group has two minutes to create a frozen monster using their bodies. Visit each one in turn and share observations. - 3 arms, 5 heads, 8 legs, 2 wings, 1 horn and 1 tail! Visit each group in turn and share observations. Give the groups a further two minutes to work out how the monster moves and speaks. Visit each group in turn, watch it move and speak. Share observations. Reshuffle the groups and start again. To regain focus at any point turn the monsters into statues or use slow motion. Try using larger groups or even the whole class. This first book in the West End in Schools SUBJECT SERIES has 20 easy to follow games and exercises for Primary School teachers who want to get creative in the classroom during maths lessons. About The Book: The main aim of the book is to provide teachers with a resource of games to help manage children's energy and engagement in the class. 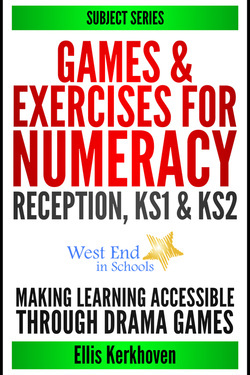 Each game has a 'numeracy element' so it can be used within Maths lessons.